The Embraer E190-E2 vs Airbus A220 – What Plane Is Best? Edit: This article has caused a fiery debate among our readers and the author has been accused of being both an Airbus employee and an Embraer employee. Whilst it would be great to be double dipping and getting paid by both, please understand that we endeavor to not be biased and write as fair articles as possible. There has been a lot of debate recently in our comment sections about which manufacturer builds the better small jet aircraft, Embraer or Bombardier. 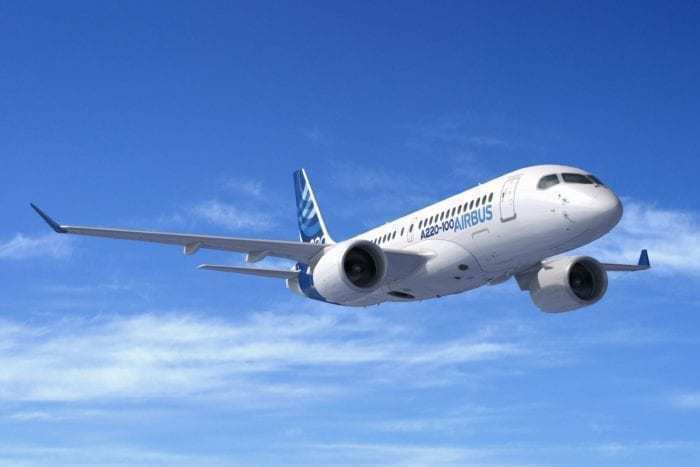 In fact, with Airbus buying up the A220 program, and Boeing following in their heels with 80% of Embraer’s commercial jets, this market is ready to erupt. 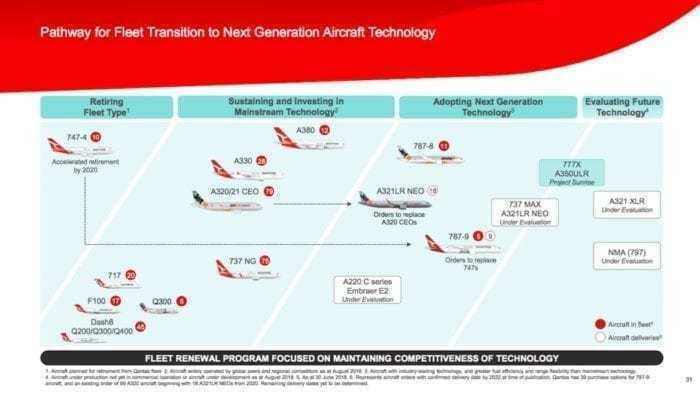 Some airlines are wrestling with this question themselves, such as Qantas (who last year revealed that they are choosing between these aircraft) and Delta (who increased their order of A220 aircraft). So why not compare the two headlining aircraft head to head and see which come out on top, the Embraer E190-E2 vs Airbus A220. As many of our readers at Simple Flying work for both Airbus, Boeing, Embraer, and Bombardier (and many more are fans of the aircraft), if there are any mistakes please do let us know in the comments. How will we compare these two aircraft? As we have done with other articles, we will pretend that we are a airline that is deciding between the two aircraft. This means we will be looking at what makes economic sense and will generate as much profit as possible, rather than what is simply the best passenger experience, easiest for the crew to fly or just a prestigious brand. Additionally, there are multiple variants of each aircraft. To keep this fair, we will be examining the following. Without further ado, let us dive in. *** this fact seems to be wrong, as the physics don’t seem to make sense. We have contacted Airbus for clarification and in the mean time will not be using it in our analysis. Already by looking above we can see that there are some very close calls, so let’s go into a bit more detail and see what we can discover. 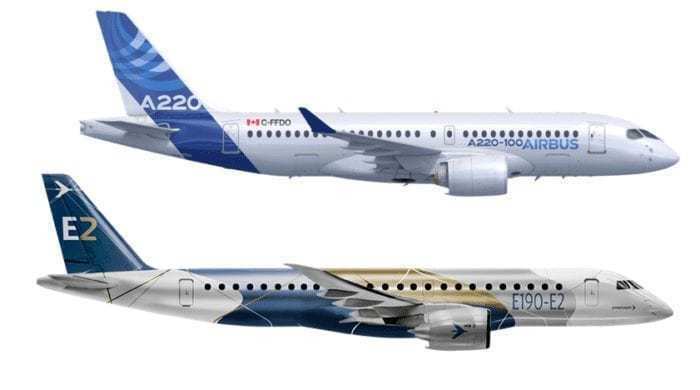 From first glance, it looks like that Airbus has the Embraer aircraft beat. After all, Airbus has the slightly bigger plane with the A220-300 and thus must be better for passengers right? Not exactly. Both the Embraer jets have more premium passengers than the A220-100 (12 vs 8) and only the A220-300 can match them. Everyone knows that premium passengers make more money from an airline, and four extra business tickets might be worth 10 economy tickets, if not more. Plus, look at those default seat pitches on the Embraer aircraft, 31 vs 28 inches. Whilst we don’t want to dive into specific measurements (in literal inches), that little bit of extra room in economy would be a blessing for those over 6 feet tall. Overall, the E190 has the A220-100 beat in terms of passengers. Whilst the A220 can carry a few more economy passengers (12) the extra premium passengers will easily mean more money for the airline. Plus more room on board for those economy passengers is always a nice comfort. But if we were to include the A220-300 vs the E195, the larger A220 scrapes by with those extra 10 passengers (they both have equal premium passenger seats). We know that the A220 has bigger fuel tanks than the Embraer but how does this translate into distance? The A220-100 is smoked by the E190-E2 by a good 500 km. Whilst this might not seem like much, it can mean the difference between short-haul regional travel to international destinations. This is despite the A220-100 carrying far more fuel than the E190, and leads us to believe that the A220-100 is simply not very fuel efficient when compared. However, if we compare the A220-300 with the E195 we can see that the fuel and bigger thrust does translate into longer distances. For whatever reason, the E195 drops the ball and get beaten by the A220-300 over a 1000 km extra. If you are an airline looking for a versatile aircraft with good passenger capacity, then why not choose the A220-300? As you can see, the E2 family of aircraft is far cheaper to buy than the Airbus Aircraft. However, Airbus does have a larger ‘production’ scale and thus might be able to drop the price. They might be able to drop the price by so much that they pretty much give the aircraft to you at cost… just like how Delta is rumored to have so many A220 aircraft on order. Which is more popular with Airlines? After looking at all the various factors, it becomes clear that neither company is best. The E190 beats the A220-100, but the A220-300 beats the E195. When it comes to technicals, I think we can agree that it’s a draw. But if you are looking to buy and want to get bang for your buck, the newer E2 range of aircraft might be just what you are looking for. I believe there are errors in your numbers, specifically on the take off distance and the range of the Embraer 190. That is why the A220 100 is able to fly to the London City airport. On the Embraer website the Take Off distance for the 190 E2 is 1615 meters or 5298 Ft and not 1450 m or 4760 ft. The range is is 2931 nm and not and not 3250 nm. The A220 100 has a longer range, shorter take off and caries more passengers in a 3 class configuration 120 vs 97) than the Embraer 190 E2. Does that change your conclusions? Approach capability should also be compared. The C Series steep approach allows it to access some airports that E2s can’t, namely LCY. One error to note is that greater thrust does not translate to a range increase as suggested. The thrust bump needed for the A220-300 is required for the increased weight under takeoff and climb conditions. Aircraft throttle back at cruise and the thrust required by a -300 at cruise is well within the capability of a -100. Not sure if you’ve done due dilligence in your research about the A220 series! Your number are way off, and therefore you came up with … not very accurate conclusions. You are also wrong about the seat pitch. This is the Delta seat pitch configuration: “Featuring 109 seats in total, the aircraft is made up of 12 First Class seats, 15 in Delta Comfort+ (34″ seat pitch) and 82 in the Main Cabin (30-31″ seat pitch). These seats all offer touchscreens, and 2Ku Wi-Fi but the biggest win here for passengers is that the seats are among the widest seats of any narrow body aircraft, (18.6″) .” Hello 28″ pitch mentioned in your article. This is for the 109 seat configuration which 12 more seats that the Embraer 190 E2 (97 seats) can carry in the same configuration. Do you work for Embraer? 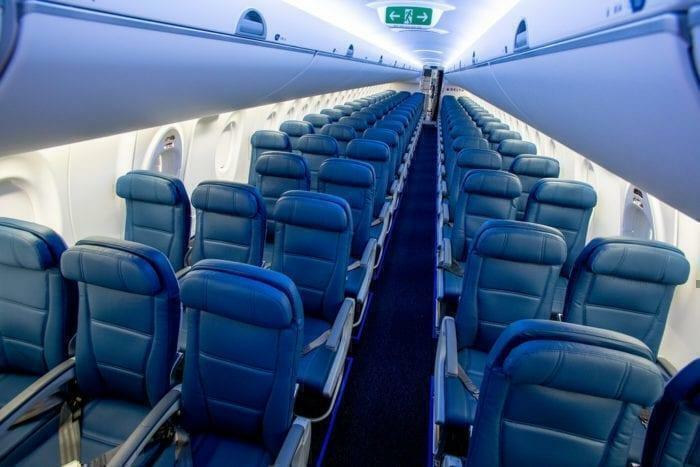 When you correct the conclusions in your article you should mention that the A220 aircraft have wider seats, larger carry-on bins, wider isle and bigger bathrooms (LUs to you) even one with a window so you can view the scenery or take photos while sitting on the throne, if you don’t have a window seat (Delta aircraft) . They also have side stick controls rather than control columns, like larger newer aircraft. I think you are correct on the listed prices but Airbus can probably compete with Embraer on the actual sale price. Sorry to insist, I forgot to mention in passenger comfort much larger windows in the A220 aircraft. Ha, for more than 20 millions less welcome Embraer/Boeing to the next Gen aircraft to me in no brainer business. This “article” is full of errors. The most obvious for me is that it claims that the A220-300 has a higher empty weight (obviously), carries less fuel (believable), and has greater range (not possible if the fuel numbers are correct) than the A220-100. Two variants of the same plane and you think the heavier one with less fuel capacity has greater range? I have a bridge to sell you. This was an absurdly useless comparison. As others pointed out you got the numbers wrong and don’t seem to understand that things like the number of seats and pitch are determined by the airline and vary widely. Worst of all it reads like it was written by an eighth grader. What a waste of time. Looking at this from a pax perspective how does 2/3 vs 2/2 configuration become a push? The pitch is excellent but that can and will change but usually not so much on the configuration and width. Suggest one take a DL 220 in February in a middle seat then review this article…. So basically this whole comparison is wrong. Have some respect to your readers and rewrite this thing or remove it. 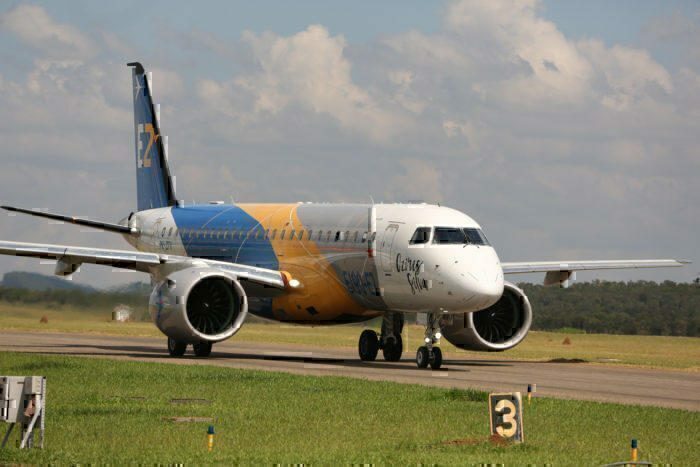 people the actual range of the E2-190 is 3250nm….Embraer downplayed the performance of this variant so as not to get caught up in the Boeing and bombardier trade dispute https://leehamnews.com/2018/06/18/pontifications-why-embraer-downplayed-range-of-ejet/ …. At the top of your article, you add that you would not compare the 175-E2, yet in the orders section, you include the 100 planes ordered by Skywest. Actual amount of 190/195 orders are 158. As well, because of the scope clause, Embraer has removed that 100 plane order from it’s books, as it looks like they will never be delivered. 158 versus 537. Better than a 3 to 1 margin…and counting. Jet Blue and Moxy each also have options for an addition 60 planes each, for another 120.